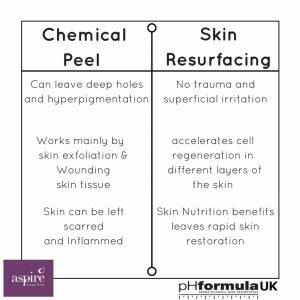 Chemical Peel VS Skin Resurfacing | Aspire & Co Ltd. Many people see chemical peels as the same as skin resurfacing or don’t quite understand the differences. There are some benefits to chemical peels, and as a well-known practice that has been part of a cosmetic physician’s toolbox for over a century, it is often the opted treatment for skin disorders. The American Society of Plastic Surgeons reported that in 2015 over 1.3 million chemical peels were performed, compared to only 500,000 reported treatments of skin resurfacing. Skin resurfacing is actually proven to be safer and often more effective than chemical peels, as experts and medical professionals with a pharma-cosmetic background have told us. It’s time for people to escape the safety net of chemical peels that are trusted simply due to its existence as a procedure, and get involved with the skin resurfacing revolution. Dr Barry Lycka explains how patients can actually get the results of a deep chemical peel with skin resurfacing, without the downtime and resulting irritation that chemical peels cause. Dr Lycka asserted Resurfacing is better, it has a better tuning and causes less problems. Deep chemical peels also use Phenol acid, which is shown to damage the heart muscle and can cause the heart to beat irregularly. Other harmful ingredients frequently used in chemical peeling include Aggressive CO2 which when used as a peel, often leaves the skin red for up to six months after treatment. Skin resurfacing in contrast, avoids ingredients Dr Lycka advises against. Skin resurfacing works from an outside in and inside out philosophy, meaning skin is able to undergo rapid restoration as no deep skin tissue wounding takes place. Skin cells are shed without the use of harmful pKa acids which cause scarring, but with a PH-DVC complex of acids which allows the skin to breathe and heal fast. pHformula maintains the skin’s health throughout treatment as Pam explains. pHformula represents a genuine advance in skin care. pHformula currently stands as the world’s first pharma cosmetic approach to skin resurfacing. To find your closest provider of pHformula treatments, visit the Aspire Directory.